Yes Or No PowerPoint Templates And PowerPoint Themes 1012-"Microsoft Powerpoint Templates and Background with human character choosing between yes or no" -Yes Or No PowerPoint Templates And PowerPoint Themes 1012-This PowerPoint template can be used for presentations relating to-"Human character choosing between yes or no, people, signs, business, success, communication" Scale peaks with our Yes Or No PowerPoint Templates And PowerPoint Themes 1012. You will come out on top. 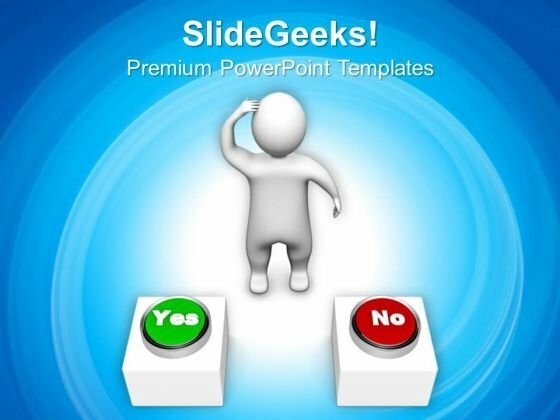 Schedule meetings with our Yes Or No PowerPoint Templates And PowerPoint Themes 1012. Download without worries with our money back guaranteee.